This text is the main content of the presentation, prepared for the conference in honor of E.M. Braverman. In its results, the text does not exceed the 3rd chapter of the book of M.A. Aiserman, E.M. Braverman and L.I. Rozonoer, The Method of Potential Functions in Machine Learning Theory, Physical-Mathematical State Publishing, Moscow (1970) – a chapter dedicated to the choice of a potential function. I.B. Muchnik argued the need for the presentation of the results of this chapter from the long-published book by the fact that these results were never translated into English and remained not well known. 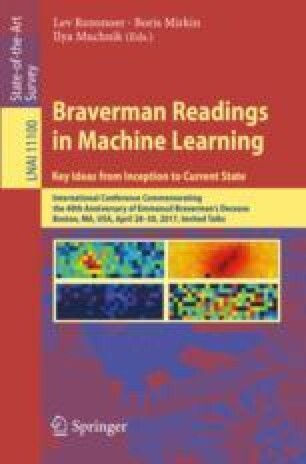 Besides this, the accents in the exposition of this presentation have significantly shifted from the exposition given in the book – here only complexity is discussed, and concrete problems of machine learning theory are not touched upon at all. The concept of compositional complexity proves useful for the choice of a potential function, and this is essentially demonstrated in the 3rd chapter of the cited book. Benjamin Rozonoer translated, and Maxim Braverman edited the translation of this section of the book (c.f. list of main publications).